A Christmas cactus is the perfect festive plant to have in bloom this time of the year. If taken care of correctly, it will be the star of your indoor plants collection. They can be a little tricky to get to flower if the conditions aren’t just right, though. 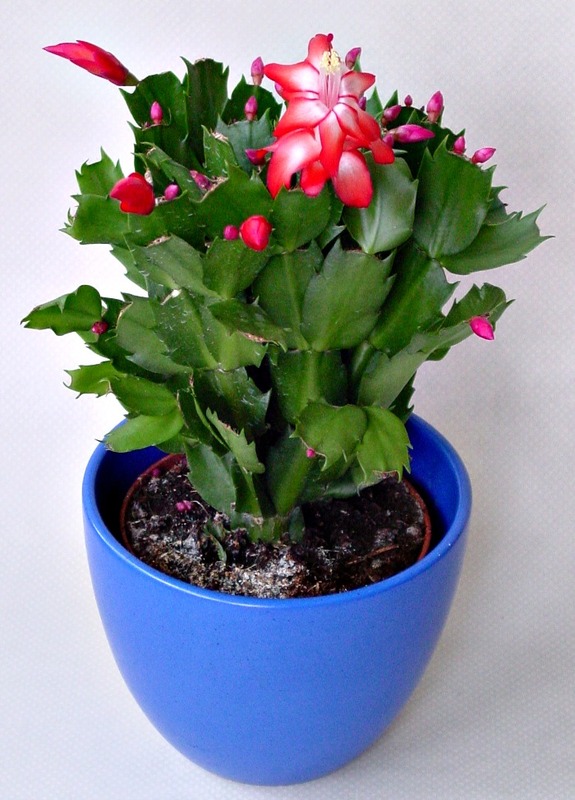 Christmas cactus (schlumbergera) is a genus of cactus plants that have about 6-9 species. They are native to the coastal mountains of South East Brazil. In the wild, the plants grow on trees or around rocks in shady spots with high humidity. This makes them need quite different care in the home than a normal cactus plant. 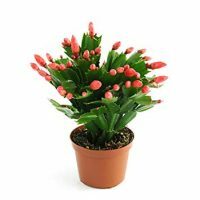 Other names for this plant are crab cactus (because of the way the leaves form), Thanksgiving Cactus – Schlumbergera truncata (also known as zygocactus) and commonly – Holiday Cactus. 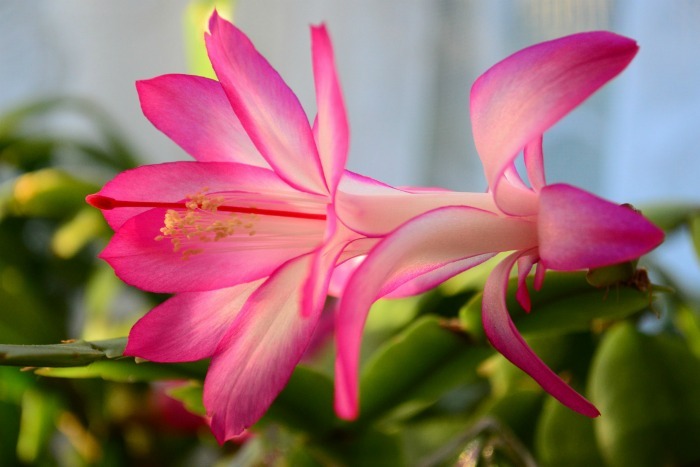 Another variety – the Easter cactus (Rhipsalidopsis gaetneri), flowers in the spring and is native to the natural forests of Brazil, rather than the tropical forests. This plant is known as a leaf cactus. The bodies of the leaves are flattened and form stems. Flowers grown from the notched areas as well as from the tips of the stems. The sight of a Christmas cactus in flower in the middle of the winter is something to behold. The flowers are long and are held more or less horizontally on the end of the stems. Older plants often take on a drooping look that is perfect for a hanging basket. Christmas cactus flowers are normally pink but there are also white, red, yellow, and purple varieties. Blooms are quite long lasting. Does your Christmas Cactus Flower each Year? It’s fine to purchase a plant in bloom and have it flower for you, but how do you get it to re-flower each year? I have neglected my Christmas cactus, replanted it, dried it out and more but I still seem to be able to get mine to come back year after year by making sure that I follow these tips at the right time. 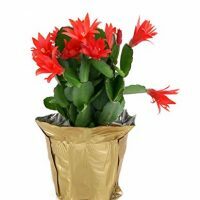 If you love to grow flowering houseplants, especially those that will bloom in the cold winter months, Christmas cactus is a fabulous choice. What does a Christmas cactus need to flower each year? 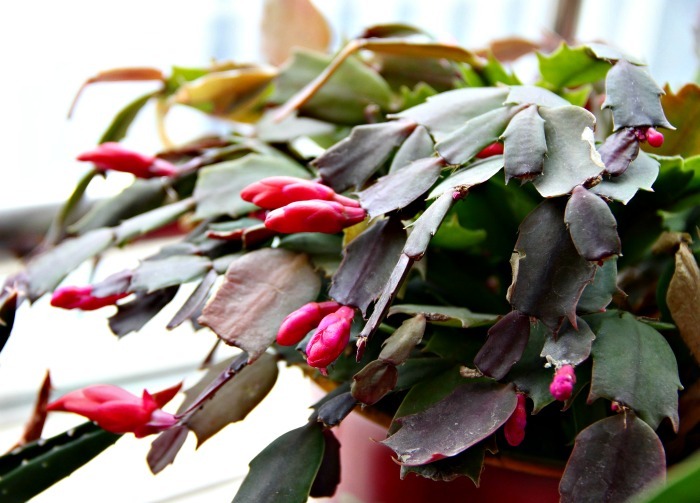 Here are some tips to remember to get your Christmas cactus blooming each year. The Christmas cactus needs short days and cool night temperatures to bloom well. High humidity, bright light and slightly moist soil are also essential. I keep my Christmas cactus outside in my garden during the summer in a semi shady flower bed, right in its pot. I don’t bring it in until the danger of frost is imminent. This practice gives my plant the shorter days and cool nights it needs. I’ve never had it fail to flower following this pattern. If you have your Thanksgiving or Christmas cactus outdoors, they will do fine until the temperatures dip into the 40s. Then it’s time to bring them indoors. In order to force the plant to bloom each year, it’s necessary to have a period of darkness. This mimics what happens in the wild in nature when the days get shorter. Keep it in the dark. These plants really do love darkness. Don’t keep it in a room where lights are on well into the evening. It flowers best if it is dark for 12 or 13 hours each day. Don’t prune the flat, arching stems (buds form on the tips), and don’t fertilize heavily, or you encourage only vegetative growth and not flower buds. For next year’s blooms, do as I described above. Place it outdoors in a spot where it is protected from strong mid-day sun. Leave it there as late into fall as possible, bringing inside only when frost threatens. When you bring the cactus indoors, place it in a bright window where temperatures drop to 55°F to 60°F at night. If nights are a bit warmer (65°F or so), it will take longer for buds to develop. Keep them in this type of cool area, being sure to keeping them away from all light between the hours of 5 p.m. and 8 a.m., and water the plant weekly. The plants should come into bloom between early December and through to January. If you would like the plant to bloom sooner, just start the cool temperatures and short day treatment earlier in the year. 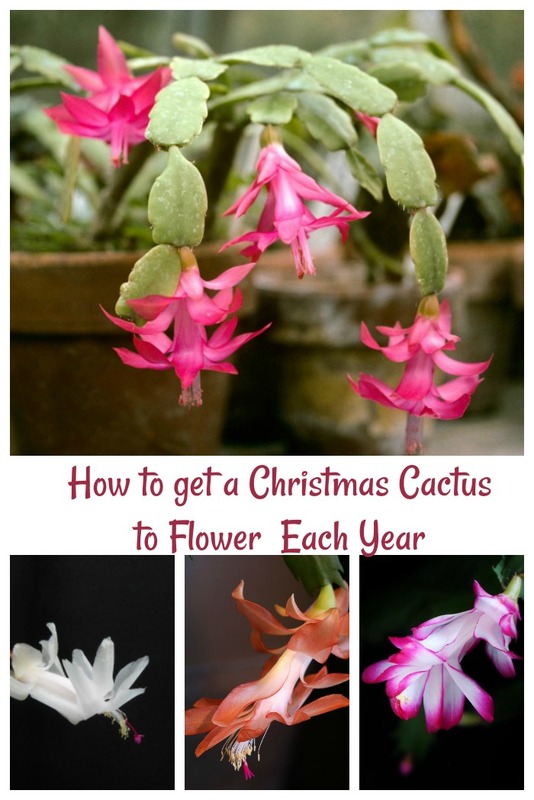 If you follow these steps, you will have a Christmas cactus that is a delight each holiday season. I divided my huge plant this past summer, and this year I have two large plants just full of blooms. What is your favorite seasonal holiday gardening tip? Let us know in the comments below. 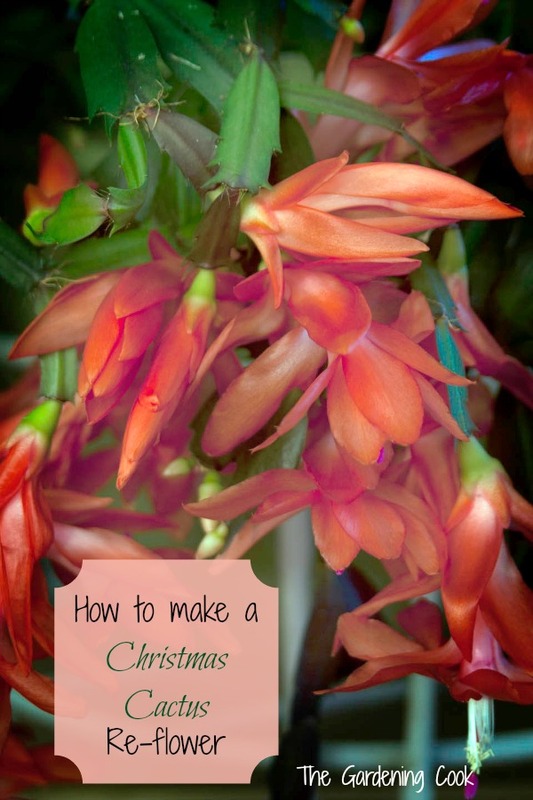 Would you like a reminder of these tips for getting your Christmas cactus to flower each year? Just pin this image to one of your Gardening Boards on Pinterest. 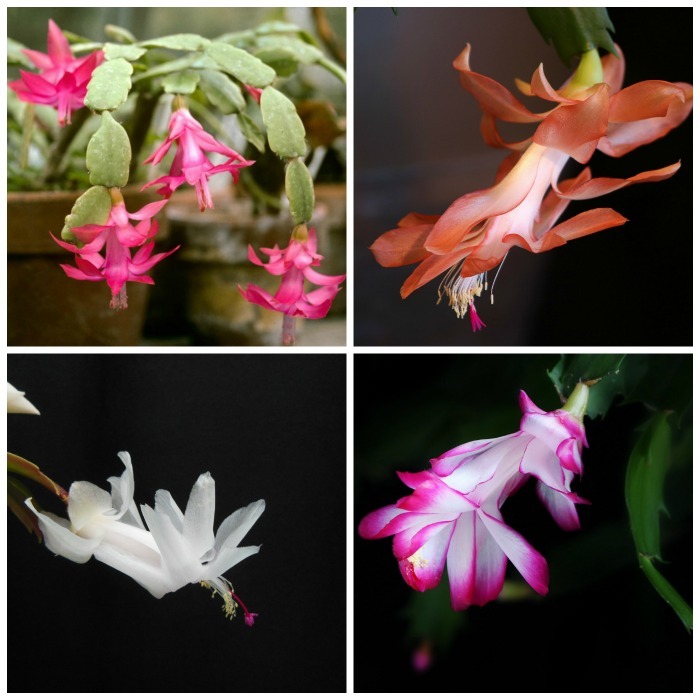 Admin note: This post for getting a Christmas cactus to flower each year first appeared on the blog in December of 2012. I have updated the post to include a care card, extra tips and a video for you to enjoy. 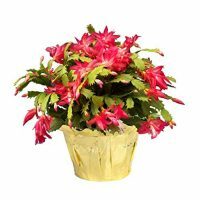 Christmas cactus is one of the seasonal flowering plants that makes a great show of color during the holidays. Find out how to get it to flower each year. 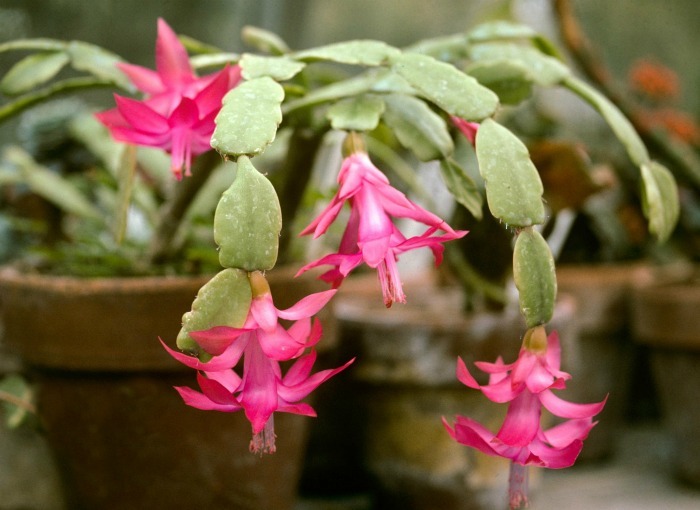 Keep your Christmas cactus outside during the summer months in a shady spot. Water normally. When the temperatures dip into the 40s bring the plant indoors, taking care to inspect for bugs. Water sparingly and do not fertilize or prune. Once it sets blooms bring to a semi sunny spot and water lightly each week. Thanksgiving Cactus is similar but comes into bloom around Thanksgiving time. Easter Cactus flowers in the spring but needs a period of dryness to force blooms. My mother-in-law had a cactus (now her son has it) that is 75 yrs old. She fed it bloody water every one in a while and it always bloomed. Hi ~ Can you please discuss how often to water? Mine was doing great for the first year, but seems to be dying now. Thank you! Hi Hillary. I’ll just add a little to my other comment. Right now mine is flowering and I water it when the soil is dry down about the the first knuckle when I put my finger in the soil. It needs more water when it is flowering. Once it is done, I water far less. In the summer I water mine every day. They are in full sun on my porch in a western exposure. I live in S. Florida and mine bloom twice a year. Thanks for the share. I’ve never hea d of bloody water. Love the cactus mine has one bloom on it I would like to know what bloody water is? Just how often should these plants be watered? I think I was overwatering mine this past spring, so I repotted it and barely watered it. We had someone house sitting for us and they only watered it a couple times in the 6 weeks we were gone. But it looked great when we came back. I brought it in just before frost and it has buds on it now but I’m afraid to start the watering routine again. I thought I’d lost it. It depends a lot on the time of the year. When it is getting to the flowering time, cutting back on water does seem to help as well as giving it lower light for a while. In the summer I put mine outdoors and water only when it gets fairly dry. The leaves are somewhat succulent and store water so too much can bloat it. Thanks so much Carol. I haven’t watered it yet and so far, the buds are staying on the plant. But I need to arrange for it to have more darkness. I’m keeping my fingers crossed that I’ll see some blooms this year as in years past, once the buds appear, they just fall off the plant. Once you see buds you need to start watering it. when the blooms are fading is it ok to pinch them off? Will that promote or detour more blooms? Hi Amy. Yes that is fine. If you leave them, they will drop off on their own, but pinching them off is fine. It will not encourage more blooms, since they take some time to set but will make the plant more attractive. I have had one of mine for years, I hang it out off one of my large shrubs funny though it gets quite a bit of sun all year and That old sucker blooms no matter what, I do nothing special to it just water, that’s all I do for all my house plants! I have bought 2 more Christmas cactus and both bloomed nicely, the larger one just bloomed out a few weeks ago and now is developing new buds! Hoping for another round of flowers. I’m in NC. I keep mine outdoors in the summer time and bring it in when the temps start to drop and the days get shorter. I have used the closet trick when I lived in Australia with success. Again what is bloody water? blooms for weeks on end. Mom has passed but I do not know how much castor oil to use and how often? Does any one have an answer to this. only had two blooms? Will also try all of the above suggestions in the future now. I think that was just a figure of speech!! My mothers Christmas cactus was huge and amazing blooms. She also swore by a dose of castor oil. I keep mine outside on the porch in shade, watering once a week & misting on occasion bringing them indoors in October to a cool bathroom, dark with a nightlight. Beautiful blooms, no problems. The bloody water was not a figure of speech. I learned this from a nurse many years ago. When I thaw frozen beef, pork, or chicken, I will save the bloody that is in the zip lock bag & add it to a gallon of water. I then water my plants with it. I only do this once every 6-8 weeks. I only use about 1/4 cup to a gallon of water, so it is very diluted. i think the comment about blood water was probably a mixture of blood meal with water. Blood Meal is an all natural organic source of nitrogen. Blood Meal promotes rapid growth and deep, dark green color, and is an ideal supplement for all annuals and perennials. You can buy it at Walmart or any garden center. I buy it for my roses. 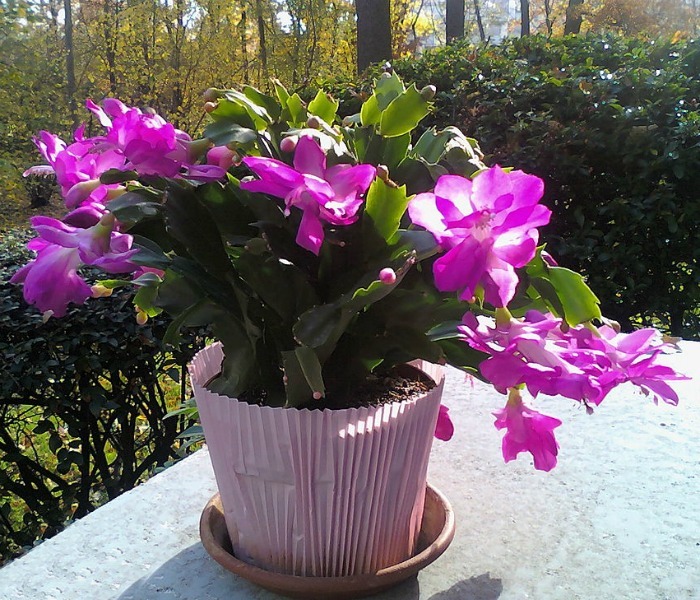 Hi – I have grown these for 40 years with success, but for the past 10 years my Christmas cactus just continually drop their leaves and never bloom. I am not doing anything differently from before. I’ve repotted and restarted them. What is causing them to drop their leaves??? Hi Wendy. From my experience, the older a Christmas cactus gets, the woodier the stems get. I have no problem getting a plant to flower for the first few years but older plants always give me extra problems. How do you get the cuttings to start a new plant. Do you put them in water or just stick them back in moist soil? I let them dry out a bit on the end, and use rooting powder and soil starting soil. You can root them in water, but soil started cuttings are generally stronger plants.